70 million players around the world play the game in 15 languages. A friendly zombie falls in love with a girl and sets off in search for Zombium to become a Human. The world of zombies is vast, bright, and full of funny characters. Explore magnificent islands and make your way through the thickets to take a step closer to solving the Zombie’s secret. Grow unusual plants, fruits, and flowers to cook Zombium. Construct world famous buildings, complete tasks, and decorate your island to become a Human and find your Love. In the game you’ll find various zombie-workers helping you clear the island and build a town, such as woodcutters, stoneminers, fishermen, treasure hunters and cooks. You'll be able to harvest dozens of unique plants and make terrific potions. You can travel to different islands in search of new treasures in order to reach the Ancestors’ Land, become a Human, and then return to the city of people and find your Love. Smoother, faster game play due to bug fixes and stability improvements. If you feel like taking time off and catching up on sleep, travel to the Dream Island. *The new island is available for everyone but for a limited period of time! Don't waste a minute! A new island means new adventures! - Visit the wise Druids and find out why spring is not coming to the islands. - The new island is available for everyone but for a limited period of time! Don't waste a minute! - Do you know who makes the best lemonade? Maybe you know if you can walk on the rainbow? No? Then pack your bags, we're going to the Leprechaun Island! Do you know who makes the best lemonade? Maybe you know if you can walk on the rainbow? No? Then pack your bags, we're going to the Leprechaun Island! - Amy's getting closer to cracking the mystery of her transformation into a zombie. - Travel across two new locations to dig into a life story of Zombie's love! Once a year the winged creatures from the Island of Dragons fulfill the most cherished desires of zombies. Make a wish and pull anchor! - Zombie is in for winter fun! Enjoy slopes and trails of a cozy, yet mysterious village! - Finally! The first snow has come, and right on time! Now Zombie can enjoy the snowfall over the holidays! - Join the devs in pursuit of the malicious Oops and help save Christmas. Travel through 12 festive islands. Meet old foes and save good friends; face your past, break the evil spell, and dress... the Christmas Rocket. You have 30 days to complete all 12 locations. Have fun! - Smoother, faster game play due to bug fixes and stability improvements. - This Christmas Z. Chief called on Santa for help. Next 3 weeks open the game every day and get gifts and prizes from both! - Now important news and messages come directly to your inbox, Z-MAIL. - Advertising SDKs are updated. You never know where a blueprint found in the attic might take you. Perhaps, to a renowned inventor who needs your help with his dream project. - Ghoulie’s enrollment at the prestigious Witch Academy is at stake! Will she pass all the tests and fend off ghosts? Let's give her a hand! - Hurry up and buy outfits for Zombie! The offer is limited! - Catch restless ghosts to get a reward! Falling leaves and a romantic autumn story await Zombie in the new adventure! - The adventures of Sherlock Holmes and Zombie are coming to an end. Find out what secrets the Paskerville residents hide and what haunts the famous detective. A thorny path to creating a masterpiece and workshops from the best jewelers await Zombie in the new adventure! The adventures of Sherlock and Zombie continue! - As Zombinapur reveals its secrets to the brave detectives, the treasures of the First Zombies get closer. Behold! The amazing story-teller, the one and only Don Sanchez with the chilling story of summer, Santa, and ice-cream. Get Cinema tickets for each completed task to exchange them for unique decorations later. - Professor's Mansion turned into a crime scene! Help Zombie solve the mystery of the lost collection and track down the criminal to become a real sleuth. - Go to the Soccer Island and witness the hottest match of this summer - the title game of the World Cup! New lands and story about Samurai’s way are awaiting for you! - Take part in a traditional tea ceremony and help Zombie find his true calling! - Find a Trader on the new island to buy goods at bargain prices from him. Participate in the spring regatta to get the Winner's Cup. Become the captain of a paper boat and plough the impetuous creeks boldly! - Fascinating adventures at sea and legends of the cursed treasures await you in the Haunted Bay. - Collections are easier to use now: exchange one or ten sets in one tap. - It's become easier to find our other games! Just open the Settings inside the game. Thank you for choosing us! A new story of beacons, ghosts and greed. Note: The new island is available for everyone but for a limited period of time! Don't waste a minute! A new story about dreams, brilliance, and striving for stars is waiting for you! - Reach the abandoned Spaceport to find out who sent Zombie the Mayday call and learn the secret of the corn fields! - Reach the abandoned Spaceport* to find out who sent Zombie the Mayday call and learn the secret of the corn fields! *- The new island is available for everyone but for a limited period of time! Don't waste a minute! Have a zombastic St. Patrick's!- Get Patrick's Hat at the Market and find Pots of gold every 3 hours. Wanna keep in touch with the luckiest zombie? Buy Patrick's statue and enjoy his blessing.- JAZZLAND: Zombie musicians, best of hits, and the coolest performance venue. On with the show? Spring sale: decorations with a spring mood. Don't miss the chance to buy the things you need! - Zombie’s dramatic adventure continues! Follow him and the love of his life to the mysterious Sanctuary. Will they find there what they’re looking for?- Bug fixes. The Island of Vikings* awaits you!Zombie embarks on a dangerous journey full of vikings, valkyries, mystic artefacts. Help the formidable locals to find the missing king and reach enlightenment! *The new island is available for everyone but for a limited period of time! Don't waste a minute! Valentine's Day in Zombie Castaways!- The romantic adventures await Zombie on the Island of Cuddles. Head to the island to solve the mystery of fantastic love.- Pop balloons to get Cupid's Arrows and then exchange them for the unique Headgear!- The new island is available for everyone but for a limited period of time! Don't waste a minute!- Don't miss our Valentine's Day offer on zombucks!- Advertising SDKs are updated. Valentine's Day in Zombie Castaways!- The romantic adventures await Zombie on the Island of Cuddles. Head to the island to solve the mystery of fantastic love.- Pop balloons to get Cupid's Arrows and then exchange them for the unique Headgear!- The new island is available for everyone but for a limited period of time! Don't waste a minute!- Don't miss our Valentine's Day offer on zombucks!- Minor fixes. Hustle and bustle!- Zombie became human! Now it's time to set out to the City of Humans to meet his Love at last…- Don't miss! Ghoulie got an offer to apply for the School of Witches. She has to pass the final exam, Alchemy. You can help her!- Bug fixes. Hustle and bustle!- Zombie became human! Now it's time to set out to the City of Humans to meet his Love at last…- Don't miss! Ghoulie got an offer to apply for the School of Witches. She has to pass the final exam, Alchemy. You can help her! - Advertising SDKs are updated.- Bug fixes and performance improvements. New Year at Zombies'! Keep track of time!- Zombie's festive adventures keep rolling! It's time to solve the Twilight Island's mystery, meet its kooky locals and start the clock. Otherwise the New Year will never come.- The new island is available for everyone but for a limited period of time! Don't waste a minute! New adventures are waiting for Zombie on the Santa's Island!- Perfume experiments and meeting Santa Claus, festive magic tricks and elves' village bustle in a Christmas fashion story!- The new island is available for everyone but for a limited period of time! Don't waste a minute!- Minor fixes. New adventures are waiting for Zombie on the Santa's Island!- Perfume experiments and meeting Santa Claus, festive magic tricks and elves' village bustle in a Christmas fashion story!- The new island is available for everyone but for a limited period of time! Don't waste a minute! The Harvest Games challenge you!- Reach the Autumn Island, help your friends complete challenges, and get your deserved prize!- The new island is available for everyone but for a limited period of time! Don't waste a minute!- Minor fixes. Thanksgiving in Zombie Castaways!The Harvest Games challenge you! Reach the Autumn Island, help your friends complete challenges, and get your deserved prize! A new island means new adventures!The dream has never been so close! The Ancestors' Island won't reveal its secrets easily. But this time nothing will prevent Zombie from becoming a human! - Head to the Dino Island and help the Professor in her expedition! The time has come to solve the puzzles of ancient history!- The new island is available for everyone but for a limited period of time! Don't waste a minute!- Performance improvements. The time has come to solve the puzzles of ancient history!- Head to the Dino Island and help the Professor in her expedition!- The new island is available for everyone but for a limited period of time! Don't waste a minute! - Advertising SDKs are updated.- Minor fixes. The dream comes closer!- Reach the Giants Island and help Zombie learn the secret of turning into a human!- Fortune Machine is now quicker and easier to use! Collect prizes from all fortune chests IN ONE CLICK!- Minor bug fixes. A new island means new adventures!- Set out to the Mirrors Island and release the mirror-world captives!- The new island is available for everyone but for a limited period of time! Don't waste a minute!- Bug fixes and performance improvements. You wanted it, we made it!- New building at the Market - Fortune Machine! Open Fortune Chests from buildings on the island all in one place!- Storage became handier! New search field and tabs for quicker access to your zombie workers and buildings have been added within the Storage.- We turn 10! Open the game up to August 25 to get a unique Vizor Flag as a gift.- Minor fixes. - The search for love continues! Set out for the Flying Island and find Hope there!- Not a fan of spinning roulettes? Think it's too boring? Good news! From now on, instead of spinning a roulette inside buildings, choose a chest to open and grab your prize.- Minor fixes. - The search for love continues! Set out for the Flying Island and find Hope there!- Not a fan of spinning roulettes? Think it's too boring? Good news! From now on, instead of spinning a roulette inside buildings, choose a chest to open and grab your prize. The problem with objects missing on the islands has been fixed. A new island means new adventures!- Head to the Green Island together to help Zombie protect the environment from the alarming pollution rates!- The new island is available for everyone but for a limited period of time! Don't waste a minute! Don't miss an incredible offer! A free set of Bangs for you to clean up islands even faster! The story of searching for Zombie's love continues!Is Zombie afraid of the dark? What is he ready to do in the name of Love?- Mysterious dungeons, secret artifacts and Zombie's new friend are already waiting for you!- Exploring islands is getting monotonous? Use Bangs for easier island cleanups. Let's celebrate Zombie's birthday together!- A festive island, new adventures and the fulfillment of cherished dreams await you!- The new island is available for everyone but for a limited period of time! Don't waste a minute!- Flower Island quest bugs have been fixed. Let's celebrate Zombie's birthday together!- A festive island, new adventures and the fulfillment of cherished dreams await you!- The new island is available for everyone but for a limited period of time! Don't waste a minute! - Place the Flower Basket in the Big Land and find the bouquets with useful resources on the island every three hours!- Flower Basket can be bought at the Market, but only for a limited time. Hurry up!- Bug fixes and performance improvements. Late spring surprise from Zombie!- Place the Flower Basket in the Big Land and find the bouquets with useful resources on the island every three hours!- Flower Basket can be bought at the Market, but only for a limited time. Hurry up!- Bug fixes and performance improvements. The holiday goes on!- Head to the Easter Island right now to help artist bunnies prepare gifts for the holiday and collect your own set of Easter eggs!- The new island is available for everyone but for a limited period of time! Don't waste a minute!- Enjoy the new design of the MAP! Easy to use, it now gives you much more information about all the islands! The holiday is just round the corner, and you are not even ready yet?- Head to the Easter Island right now to help artist bunnies prepare gifts for the holiday and collect your own set of Easter eggs!- The new island is available for everyone but for a limited period of time! Don't waste a minute!- On April 14 you'll get an awesome surprise from Zombies! Don't miss!- Minor fixes. Adventures are calling!Start your journey to the Shamans Island & find the mysterious totems! - True spring mood and a continuation of Zombie's love story hit the game!- The brand-new Toys Island and the mystical Shaman Mask are waiting!- Bug fixes and performance improvements. - True spring mood and a continuation of Zombie's love story hit the game!- The brand-new Toys Island and the mystical Shaman Mask are waiting!- Minor fixes. - Want to save resources? Get the brand-new unique buildings that have no construction stages and are ready for use!- FB synchronization fix. - Join Zombie on his trip to the Volcano Island and rescue the locals from the volcano eruption!- The new island is available for everyone but for a limited period of time! Don't waste a minute!- Huawei loading fixes and performance improvements. A new island means new adventures!- Join Zombie on his trip to the Volcano Island and rescue the locals from the volcano eruption!- The new island is available for everyone but for a limited period of time! Don't waste a minute!- Bug fixes and performance improvements. A new island means new adventures!! !- Join Zombie on his trip to the Volcano Island and rescue the locals from the volcano eruption!- The new island is available for everyone but for a limited period of time! Don't waste a minute!- Some fixes. - Valentine's Day in Zombie Castaways! Complete new quests and find a photo of your Beloved on the Island of Hearts to continue your search for love!- The new island is available for everyone but for a limited period of time! Don't waste a minute!- Don't miss our Valentine's Day Special! All zombucks purchased on February 13-15 will be doubled!- Minor fixes. - New Year in Zombie Castaways!- Hurry up to explore the Fir Island and find the prettiest New Year tree!- Minor fixes. 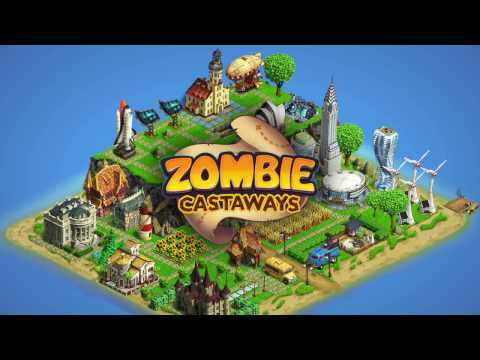 - New Year in Zombie Castaways!- Hurry up to explore the Fir Island and find the prettiest New Year tree! Enjoy Christmas in Zombie Castaways!- Complete new quests and explore the Christmas Island.- Help Zombie save the celebration and get valuable prizes for doing so.- Minor fixes.- Don't miss our Christmas offer on zombucks! Enjoy Christmas in Zombie Castaways!- Complete new quests and explore the Christmas Island.- Help Zombie save the celebration and get valuable prizes for doing so.- Minor fixes. - Thanksgiving Zombie-style!!! Complete new quests, search for turkeys in secret treasures, and build a Cornucopia to get awesome prizes!- Don't miss Zombies' Black Friday! Enjoy the sales on most-wanted items at the Market! - Fruit trees, new recipes and collections await you!! !- A new helper lands on your farm! The Airplane will plow beds, sow, fertilize, and harvest your crops and trees in one click and faster than a Brigade!- Minor fixes. - Zombie Halloween starts now!!! Hurry up to reach the temporary Spooky Island to solve all its dark secrets and save the world from the evil!- The new island is available for everyone but for a limited period of time! Don't waste a minute!- More surprises! 3 brand-new Halloween buildings are waiting for you on the Spooky Island! Build the Altar, Jack's Pumpkin, and Halloween Lighthouse and turn them into awesome gifts!- The time frame to start exploring Spooky Island has been extended. - It's transformation time! Buy buildings at the Market and transform them into heaps of gifts! Please welcome: the Sphinx, the Diamond Eye, and the Great Oops!- Bug fixes and performance improvements. It's transformation time! Buy buildings at the Market and transform them into heaps of gifts! Please welcome: the Sphinx, the Diamond Eye, and the Great Oops! - Golden Season's in full swing and Zombie's adventure continues!- Make it to the temporary Harvest Island and build the Herbarium to turn it into impressive gifts!- The new island is available to all, yet only for a limited time. So, hurry up! 1.4.1:- Minor fixes1.4:- The ancient legend awaits you! Complete the 'Legend of the horse' quest on the Mad Island and reach the Troy Island.- Explore the ruins of the legendary Troy and build the Ark to travel to the Small Island.- Help the mysterious dwellers of the Small Island solve their Big problem! - The ancient legend awaits you! Complete the 'Legend of the horse' quest on the Mad Island and reach the Troy Island.- Explore the ruins of the legendary Troy and build the Ark to travel to the Small Island.- Help the mysterious dwellers of the Small Island solve their Big problem! 1.3.1:Bug fixes and performance improvements.1.3:Friends, the adventure continues:- Two brand-new islands with exciting tasks and rich treasures await you!- Complete all quests on the Mad Island, build the pier and set out to the Uninhabited Island, the home of the lonely Rombison.- Repair Rombison's ship, reach the Pirate Island and find the untold riches of gentlemen of fortune. Friends, the adventure continues:- Two brand-new islands with exciting tasks and rich treasures await you!- Complete all quests on the Mad Island, build the pier and set out to the Uninhabited Island, the home of the lonely Rombison.- Repair Rombison's ship, reach the Pirate Island and find the untold riches of gentlemen of fortune. This update features:• New Star Island.• Seven Ice Palaces on the Star Island that you can build and transform into heaps of gifts.• New Winter Set that can be found on the Star Island.• On the Star Island you can also find Stars that will help you speed up the work of Cooks and other zombie-workers.• New recipe to make Water using Ice and Fire. Dear friends,We are constantly working on improving our game. This update features:- Enlarged interface for some devices for better game experience.- Map scale doesn't change while traveling between the islands or closing the game.- From now on you can ask us questions or send reports right from the game! To do so, use the Contact Us button.- Notification issue is fixed.We're looking forward to your feedback at zs@vizor-interactive.com!